February 8, 2019 | By Amy Occhipinti, M.S. Editor's Note: This post was originally published February 1, 2015 and has recently been updated and revised for accuracy and comprehensiveness. Normal office chairs are notorious for negatively impacting your posture, especially if you are sitting in them improperly. Slouching in your chair may also lead to a decrease in your core strength. The solution? It may be replacing your office chair for a stability ball. On a stability ball, you spend your time actively balancing, so your body automatically forms a more correct posture. This can alleviate any back or core strain that you may have previously experienced sitting in a chair. 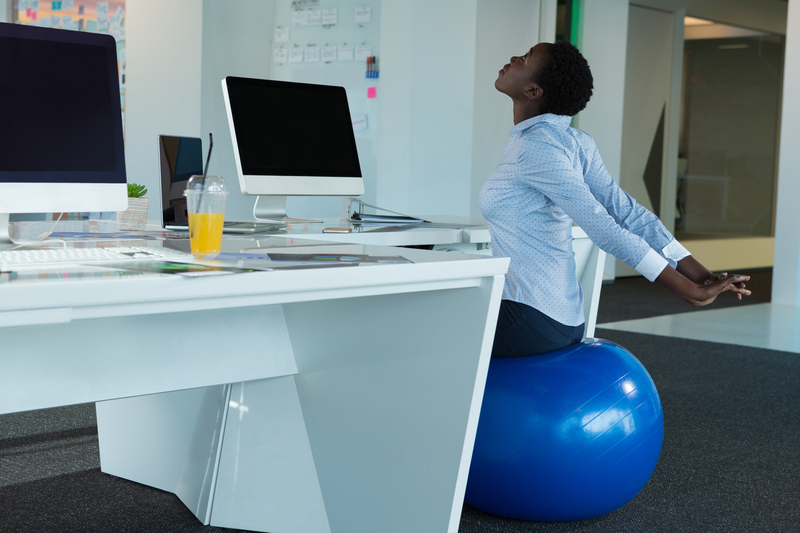 Besides just improved posture and core strength, we have culled four other benefits that you may experience by replacing your office chair with a stability ball. Let's take a look. As a personal trainer, you may not spend a large portion of your day sitting. However, many of your clients may sit for eight or more hours a day. That's where you come in. While you probably focus on form and stance during each session, part of being a successful personal trainer is integrating your knowledge and expertise beyond the gym. You must be willing to go the extra mile and offer advice that your clients can take home with them. If your client is interested in replacing the office chair with a stability ball, remind him or her of the added bonus: extra burned calories. It's simple, really: The more we move, the more calories we burn. The more time spent on the stability ball, the more you move. While you will have to focus on maintaining good posture while sitting on the stability ball, you won't be as hunched over as you could be sitting in an office chair. But the truth is, sitting on a stability ball isn't going to bring miracles or completely alleviate any pain you are experiencing. However, with regular exercise and stretching on a stability ball, you may be able to relieve some of the pain you are experiencing. We'll take a closer look at those options below. While we already discussed the negative impacts that sitting in a chair can have on your core strength, did we mention that switching to a stability ball can also help you to sculpt and tone those stubborn abs and obliques? With a stability ball, you are no longer relying on the back of the chair to keep you propped up. Instead you must engage your core, which of course leads to an increase in your core strength. Looking for an extra challenge during the workday? Maybe it's just us, but it's rather difficult as a trainer to sit on a stability ball without taking a break or two during the day to stretch out and relieve some tension. As we stated earlier in the post, the stability ball can relieve some strain you may experience in your back. It can also provide added support when you want to get a deeper stretch that you may not have been able to perform otherwise. Remember that sitting on a stability ball isn't going to be a panacea for the eight-hour workday. And, while using a stability ball can alleviate a lot of the strain you may experience when sitting in an office chair, many experts still argue whether it has the advantages people seek. The truth is, sitting all day—regardless of sitting in a chair vs. on a stability ball—can negatively impact your health. For best results, switch back and forth between using a chair and a stability ball. And, don't forget to stand up throughout the work day to mitigate any possible health concerns associated with sitting for a long period of time.